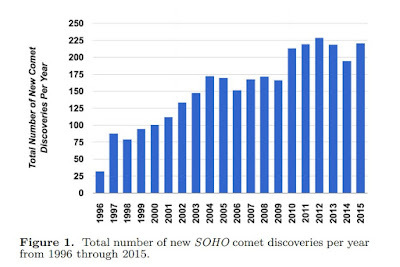 During the month of November 2016, 1 new comet has been discovered. "Current comet magnitudes" & "Daily updated asteroid flybys" pages are available at the top of this blog (or just click on the underline text here). Nov 02 Newly discovered asteroid 2016 VA came to about 90.000 km from the Earth’s surface on the second day of November, reaching magnitude 12. It crossed the Earth shadow for a few minutes (between 23:24-23:35 UT on Nov 01, just 0.3 LD from Earth), challenging astronomers to observe a peculiar “asteroidal eclipse”. Below you can see an animation showing this spectacular event as observed by G. Masi (Virtual Telescope Project). According to Masi: "Each frame comes from a 5-seconds integration. At the eclipse time, the asteroid was moving with an apparent motion of 1500"/minutes"
Nov 07 Roy Panther (1926 - 2016), British visual comet discoverer passed away. 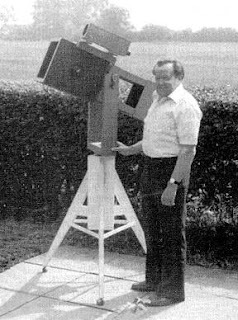 Obituary by N. James: "Roy was the discoverer of comet C/1980 Y2 (1980u). The discovery was made visually using a 0.20m, f/4 Newtonian at 1850 UT on Christmas day 1980 when the comet was a 9th magnitude object near M56. The discovery was confirmed that evening by Mike Hendrie and George Alcock and it was Roy's first success after 601 hours of searching. Martin Mobberley has an interesting Sky at Night on his Youtube channel which includes an interview with Roy." Nov 07 K. Battams & M. Knight published on Arxiv a summary paper of the more than 3,000 sungrazing and near-Sun comets discovered in coronagraph images returned by the Solar and Heliospheric Observatory (SOHO), since its launch in December 1995. Nov 10 CBET 4336 reports that minor planet (5112) KUSAJI is a binary system with an orbital period of 20.74 +/- 0.01 hr. The primary shows a period of 2.7995 +/- 0.0001 hr and has a lightcurve amplitude of 0.12 mag at solar phases 4-8 degrees, suggesting a nearly spheroidal shape.